Although, I worked behind the scenes in a flower shop for almost 20 years, I am probably the worst gardener on the planet. I think this may be a trait that I inherited from from grandmother. So, every year, I drool over and covet other peoples' gardens. My cousin, Wednesday, has a beautiful garden that she shares with her family and friends via social media. Each morning she strolls her garden and snaps some pictures to post on Facebook. Last summer, I found myself eagerly awaiting her newest photos each day. I loved watching her garden blossom and flourish. 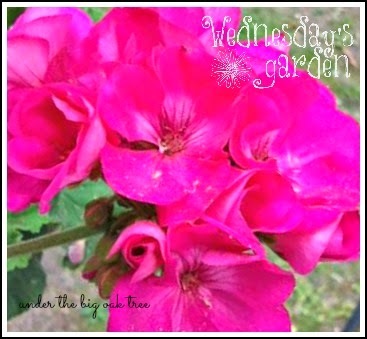 Today, and every Wednesday through the Spring and Summer, I invite you to visit Wednesday's Garden with me. Additionally, I will post a linky for anyone that would like to share their garden theme posts for the rest of us to enjoy. Before I show you this week's photos, I want to thank those that signed up last week! Mosswood Connections shared some visual processing activities for kiddos, including a Nature Treasure Hunt Mandala. Jenny Marie's Musings showed us her Basil Pot in her new weekly series, What's Growing on My Patio. We're a new linky party with a slow start, but I hope that we will have a lot more of you joining in each week as our gardens flourish. Here are a few photos that Wednesday shared with me this week, I hope you will enjoy them as much as I did. How pretty is this vibrant pink geranium? I know this would make me happy greeting me each morning! 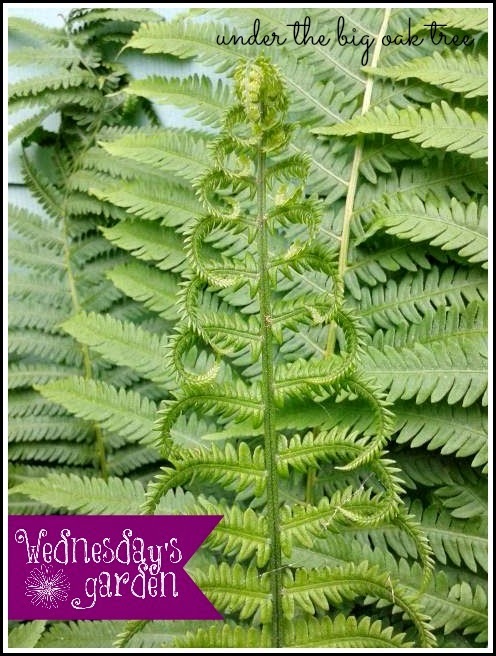 Wednesday captured this neat photo of a fern leaf! I've heard that succulent plants are pretty easy to grow. 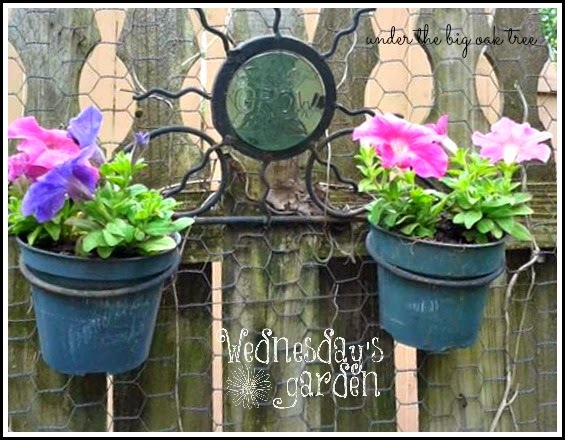 I haven't attempted these yet, but have a few planters that they would look fabulous in! 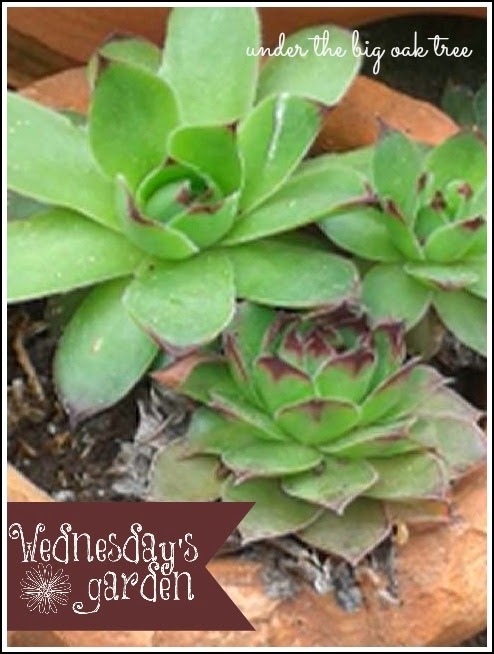 Wednesday has a few succulent planters that I will share in future installments of Wednesday's Garden. Gardening can be an expensive hobby, which is partially the reason that I haven't jumped right in with both feet. Wednesday is an expert at tending a frugal garden. From purchasing plants on clearance, or even hosting a plant swap each summer, to finding her pots and other garden accessories at yard sales, thrift shop or even curb-side (in the trash!)! 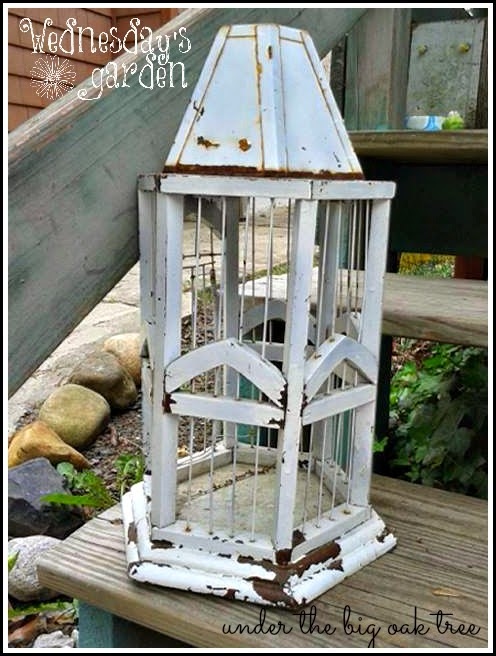 This shabby chic bird cage is Wednesday's latest curb-side find! Isn't it lovely?! This would look perfect in my house on my sofa table! I just love the chippy paint! I look forward to see how Wednesday will incorporate this into her garden. Now it's your turn! I want to see your garden! Please link up using the linky below....and don't forget to come back next week since we still have more to share! Over the weekend I tried to send a link but I kept getting an error message from the link service. Now I see that several are posted. I'm so sorry. Please delete them if you can as I do not know how to do that. Hello! Welcome to Under the Big Oak Tree! My name is Alison, I'm a stay at home mom and housewife. I enjoy cooking healthy, frugal meals for my family. As far back as I can remember, I've always wanted to be a mom. That dream finally came true when my daughter was born. She's the best thing to ever happen to me! Visit Under the Big Oak Tree's profile on Pinterest. Last chance to enter Colie's Kitchen CSN Stores giveaway! This page may contain graphics purchased from Clementine Graphics.